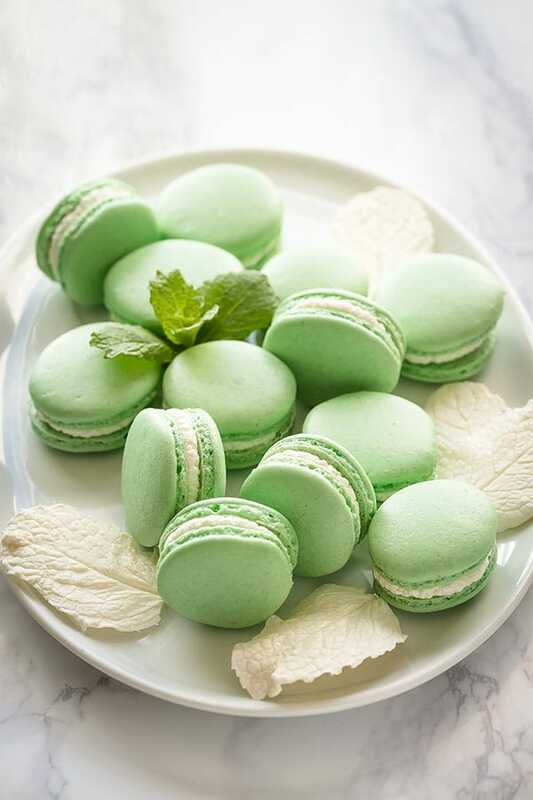 Absolutely delicious, light and minty Mint French Macarons are here to impress! 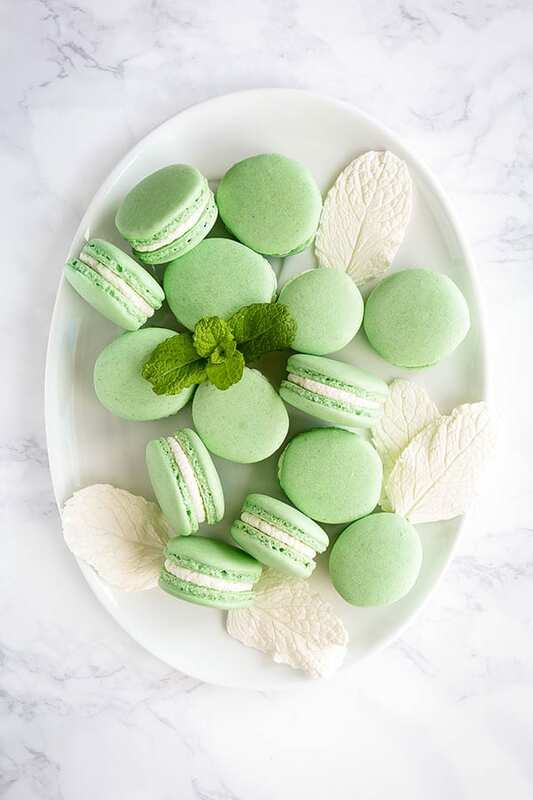 This is a perfect entry-level french macaron recipe for beginners. What’s your favorite thing to do when you’re stressed? For me, it’s baking. But definitely not macarons! Chocolate brownies, sure. Indulgent chewy cookies, yes!! But never ever french macarons! Because if those finicky macarons come out less than perfect, it’ll just make a bad day worse! You know what I mean, right? Anyhow, I still love baking macarons. Because it brings SO much joy when you pull out a tray full of perfectly round and smooth macarons with beautiful feet. Pure bliss! If you’ve ever baked macarons, you know what I mean. Now that I’ve been baking macarons for a few years, I’ve gotten so much better. I bake all of my macarons with French meringue method, because it’s much easier and perfect method for us home bakers. The downside of French meringue method is inconsistent results. It’s because French meringue is less stable than Italian meringue. What does that mean? Well, with Italian method, where you make a syrup and then pour it into egg whites, it’s practically impossible to over-whip the meringue. And with French method, over-whipped meringue will cause all kinds of problems. The most common issue is hollow macarons, and who wants that? So yeah, perfect meringue is the foundation for success. I just recently learned that the secret to perfect French meringue is to whip it on steady medium speed. 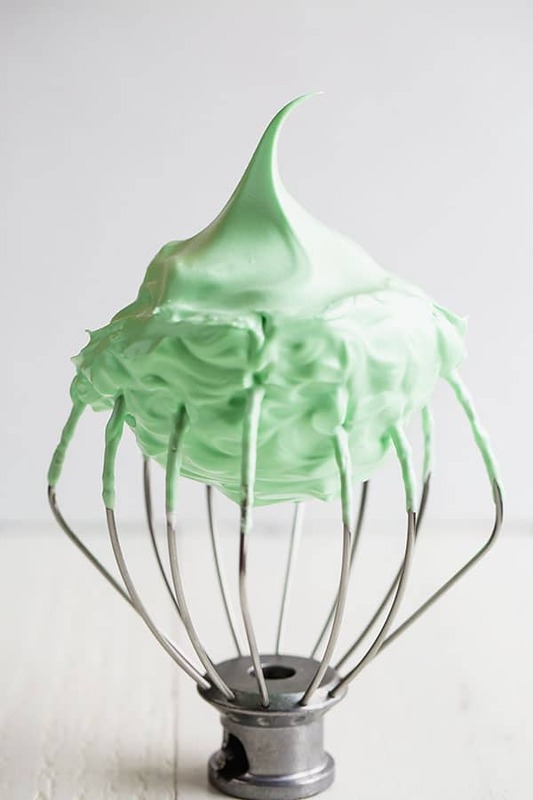 Sure, it requires longer time to get to stiff peaks, but the meringue is fluffier, fuller and ups your chances for success! Now that you have a perfect meringue, triple sift your almond flour and powdered sugar mixture. And we’ll begin the most important step in making macarons – macaronage. Your batter will look like this as you start this process. And after about 50+ folds, your batter will thin out and get runny. It’s super important to keep a close eye on the consistency. You don’t want to over-mix the batter, or it’ll get too runny and the macarons won’t hold their shape. Once you pipe the macaron shells, bake and cool them, the best part starts. FILLING!!! 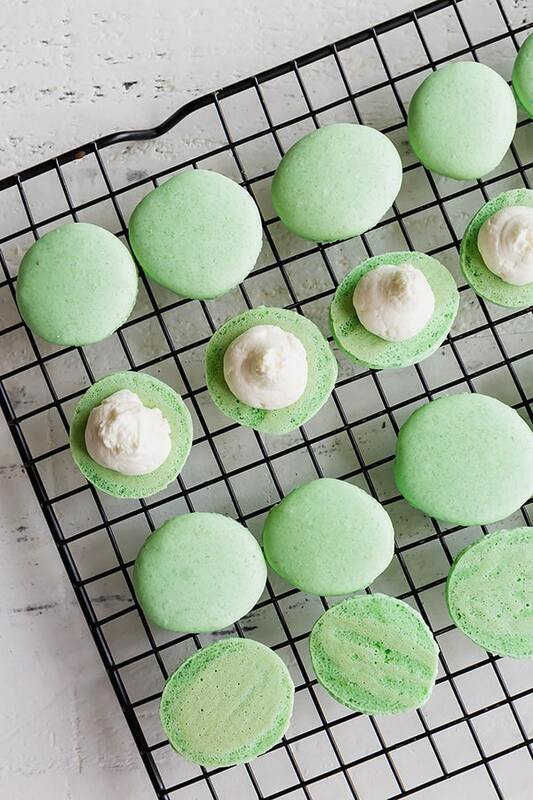 We’re using minty white chocolate ganache to fill these macarons. Super simple and super delicious. I prefer peppermint extract over mint extract here though. Or you can steep some fresh mint leaves in heavy cream and infuse your ganache that way. Ok, another quick tip! This is one tip that I almost never follow myself. You’re supposed to mature your macarons for at least 8 hours before serving. This means you refrigerate the filled macarons for at least 8 hours. In that time the filling gets a chance to soak into the shells, softening and flavoring them. And only after maturing the macarons, you can go ahead and freeze them. Filled macarons freeze beautifully, by the way. And between you and I, I eat half of the batch right after filling them. But shh, no one needs to know that! 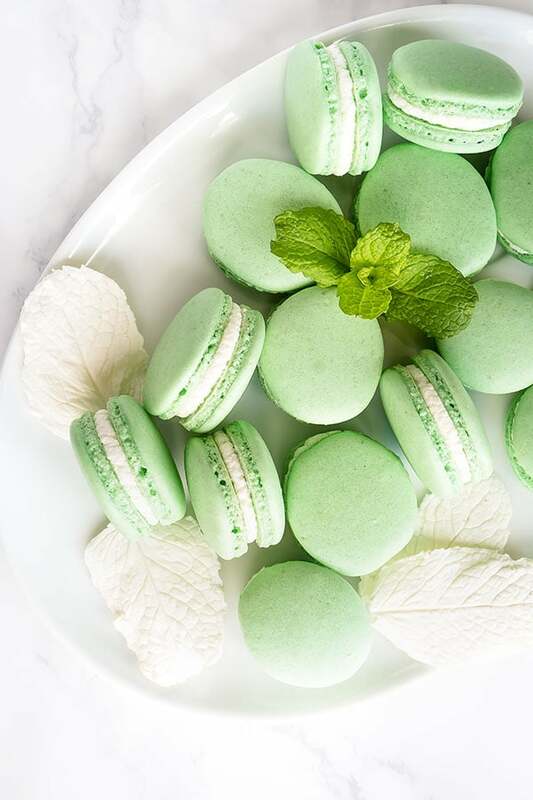 Refreshing mint French macarons with minty white chocolate ganache filling are perfect to welcome the spring! Sift together almond flour and powdered sugar twice. In a clean mixing bowl with whisk attachment, whip the egg whites until foamy. Add cream of tartar and continue to mix on medium speed. Start adding sugar one teaspoon at a time. Gradually increase the speed to medium high and beat until hard peaks form. 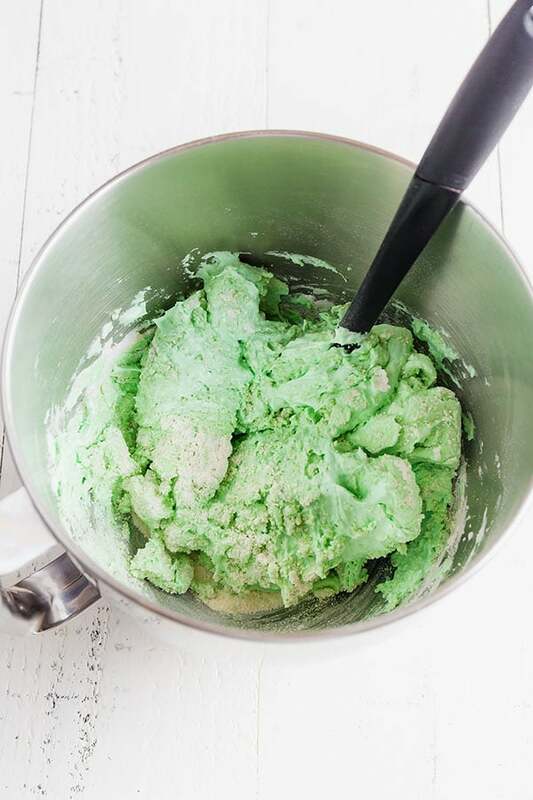 Add peppermint extract and green food coloring. Beat for a minute or two on medium speed. Sift the almond flour mixture over the beaten egg whites once again. Very gently fold the mixture, running the spatula clockwise from the bottom, up around the sides and cut the batter in half. The batter will look very thick at first, but it will get thinner as you fold. Be careful not to over mix it though. Every so often test the batter to see if it reached the right consistency. To test the batter, drop a small amount of the batter and count to ten. If the edges of the ribbon are dissolved within ten seconds, then the batter is ready. I repeat, do NOT mix again. If you still see edges, fold the batter couple more times and test again. I posted a few pictures above to show you how just couple of folding changes the consistency of the batter. This step is so crucial, so please make sure to test often to ensure not to over mix the batter. Transfer the batter into a pastry bag with a round tip. Pipe out 1.5-inch rounds about an inch apart on prepared baking sheets. Tap the baking sheets firmly on the counter a few times to get rid of any air bubbles. If you don’t release the air bubbles, they will expand during baking and crack the beautiful macarons shells. And who wants cracked macarons, right? Let the macarons rest and dry for 15-30 minutes. On a humid day, it might take an hour or so. To see if it’s ready to be baked, lightly touch it. If the batter doesn’t stick to your finger, then it’s ready. Preheat the oven to 300°F (150°C). 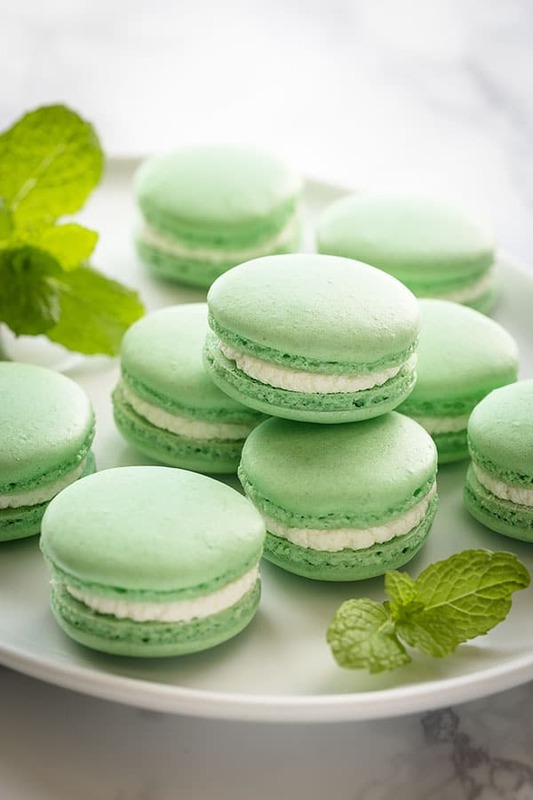 Bake the macarons for 18-20 minutes. To check the doneness, remove one macaron. If the bottom does not stick, they are done. Transfer to wire rack to cool for 15 minutes, and then remove from the baking sheets. To make the filling, bring heavy cream to a simmer, not a boil. Pour the hot cream over the white chocolate chips and let stand for 2 minutes. Then mix until smooth with a rubber spatula. 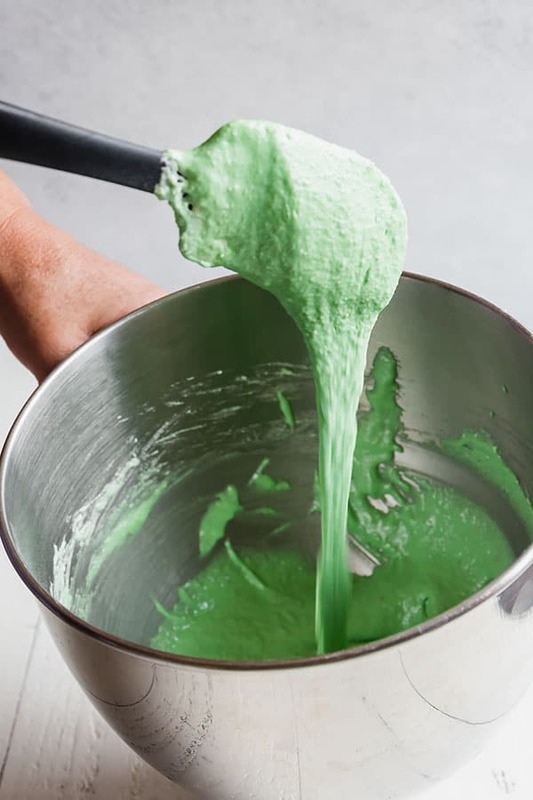 Transfer the mixture to a mixing bowl with whisk attachment, add mint extract and beat it for a few minutes until it thickens. Transfer the ganache into a pastry bag, and fill the macarons. Store the filled macarons in airtight container in the fridge for up to 5 days. You can also freeze the filled macarons in airtight container for up to 5 months. This recipe was originally published on April 7th, 2014.